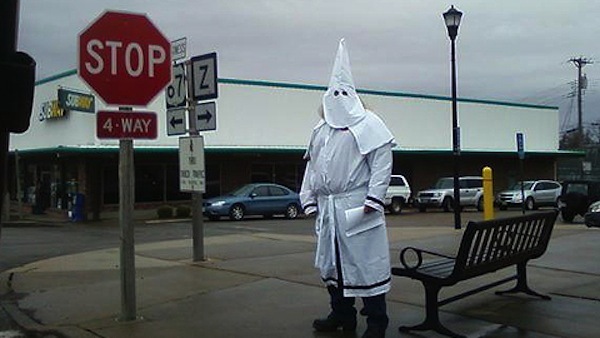 It may have looked like Halloween came really early in Park Hills, Missouri Saturday, but it wasn’t, just a bunch of racist dudes in little ghost costumes. For whatever reason Saturday was the day the local KKK decided to get the word out about their organization! …there also may have been a bake sale. None of those “black and white” cookies…just white ones. We’re also guessing a churro was hard to come by. The Park Hills Police Department received numerous complaints about the KKK members handing out flyers along main street. A spokesperson for the department said they asked the members to leave. The members left peacefully without any arrests or trouble. First off, as messed up as their organization may be, they should be allowed to offer up their disgusting opinion flyers, but they were apparently causing a scene so they were asked to leave. On the other hand, that photo above, taken by a KMOV viewer, is creepy as hell! Looks like the start of an 80s Halloween movie, like when someone sees a glimpse of Michael Meyers standing there, and when others look, he’s gone. The difference here being that when others would look this time, he would still be there, calling you “brother” a lot, while handing you a pamphlet with a bunch of stuff in it that only really old people say without cringing. Don’t ya just want to start talking to them, lean in really close so you can peek in those eye-holes, and yell out “Is that you [insert guy at office you don’t like’s name]? !” Who’s gonna take the lead to be the cool white guy at the office next week? This guy!